Hello guys today, more people than ever before are beginning to show an interest in the potential of cryptocurrencies. As perhaps the ultimate form of investment for 2018, Bitcoins and alt currencies are all the rage for financial experts, and innovators alike. However, it’s worth noting that dealing with cryptocurrency is not without its risks. For instance, did you know that a hacker could potentially trick your browser into mining cryptocurrencies without your knowledge? Researchers in the industry have begun to find scripts on the web that are available on various servers, along with website plugins that hijack your browser and use the CPU on your computer for mining purposes. What’s even more disturbing, is that these plugins can continue to mine cryptocurrency, even after you’ve closed your browser. Since mining can cost a lot of money in terms of download and bandwidth expenses, it’s a good idea to make sure that you only invest in this process when you know exactly what you might be getting into. 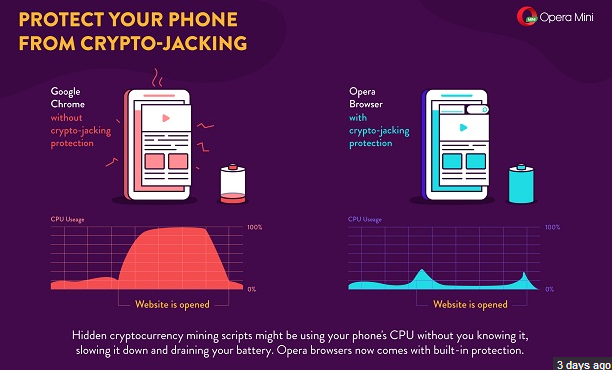 Perhaps this is why browser-maker Opera has chosen to launch a new version of Opera 50, complete with a built-in mining blocker. The latest Opera update is intended to act as a line of defense against the rising concerns around browser-based cryptocurrency miners. While using a browser might not be the most effective way for people in the Bitcoin business to collect their cryptocurrency, it can be very useful and cost-effective when accessed at scale. There are already plugin extensions available for Firefox and Chrome that can help you to block the scripts that might try to hack into your system. However, the update from Opera is the first time a major browser is investing in a mining-blocker without the need to download any extra extensions. 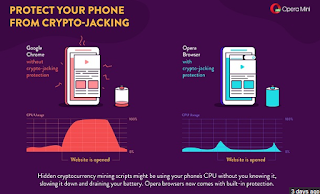 The mining-blocker comes alongside a collection of new features that were added to the new Opera browser in an attempt to draw users away from other options like Chrome and Firefox. The company has made significant efforts to differentiate itself in the competitive marketplace, with a range of novel features including a built-in VPN. If you want to find out more about mining blockers, and hackers that are using CPUs for their currency mining purposes, there are countless guides available. For instance, if you’re interested in the process of mining, you can check it out at the Bitcoin blog. However, if you simply want to protect your computer from unwarranted attacks, now might be the time to reconsider your choice of browser. To access mining protection on your Opera browser, go into your “Preferences” or “Setting” tabs. From there, the “NoCoin” setting, as Opera calls it, can be found in a list of recommended ad filters on the “ad blocking” page. When you turn this system on, any page that’s embedded with cryptocurrency mining scripts will be blocked in a way similar to how your adblocker prevents pop-ups.